I found out I have gallstones. I found out the hard way. Went to the emergency room when the pain wouldn’t stop, and a sonogram showed a few small gallstones wrecking my nice evening. The doc wanted to remove the gallbladder, but I balked. It’s the only gallbladder I have and it’s my first big attack. So we decided on a “wait and see” course. I, however, have no intention of losing my gallbladder. I know many people have had theirs removed — it’s one of the most common surgeries performed in the United States — and doctors like to remove it because they think the organ is not necessary. But I think it is. I’ve heard of a number of people who are permanently incapacitated or disabled after gallbladder removal. Some people do not have any problems, some do. I was not willing to take the risk that I might be one of the people who do. So I’m radically changing my lifestyle. I’m on a strict dietary regiment of raw foods right now. I don’t think I will stray too far from this kind of diet in the future, as fruits and veggies constitute some of the only “safe” foods I can eat. No pizza, no pasta, no whole-milks or cheeses, no cucumbers, no greasy fast foods, no processed foods, no red meat, “none of the good stuff,” the doctor said. Well, I can change that. It’s better than losing my gallbladder and possibly debilitating my digestive system for the rest of my life. God makes the body to restore itself. I will be a good girl and reduce stress, eat right, think on scriptures and godly things, and — perhaps most radically — no longer sit at a desk all day. I got an “outside of the home” job and this will greatly increase my physical activity. No more sitting at a desk and staring at a screen for 8 to 10 hours a day! Delving into the raw foods arena is interesting. I have many friends who have been on this kind of diet, and the effect is usually immediate. They feel better, they digest things better, illnesses disappear or symptoms lessen…. it’s a win-win situation. I’ve been doing some reading and shopping around for foods this week. I think I can still have coffee, but no more granulated sugar and no more half-n-half creamer. I bought agave nectar for the sweetener but was stumped when it came to finding a cream substitute. Then I saw a recipe for homemade almond milk! I’m waiting for some of the supplies to come in (I need a cheesecloth, nobody retail sells those anymore!) Apparently you soak the almonds in water and squeeze out the milk. 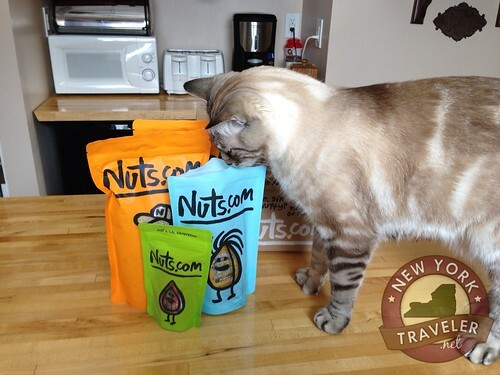 I did some comparison shopping and the best prices I found on almonds (and honey and other nuts) was Nuts.com. They are not compensating me for mentioning them — I was so tickled by their packaging and service that I snapped a photo and thought I’d mention them. I love it when companies are humorous and friendly like this! Adorable! They also threw in a little package of candied citrus, which was very sweet. 🙂 Yes, I admit that a simple smiley face on a package really does make me a loyal customer. These guys seem to really love what they do, and I love that. Hip hip hooray! Hey there nutty Rebecca! According to the galactic delivery powers that be (aka UPS), your shipment has been delivered. Yippee! We certainly hope it deliciously smashes expectations with enough force to crack a macadamia nut in the shell!!! Uncle Sandy, Cousin David, Dad, and I would love to hear from you, so what are you waiting for? OK, that TOTALLY wins me over. :beanie: Cute! Sorry about the gall-stone problem. I hope your new diet helps you avoid future problems. A few years back, Sylvia rushed me to emergency room thinking I was having a heart attack. It was the gall bladder. The said, “Remove it.” In surgery, they found it was green from gangrene. They told me I was fortunate that I hadn’t waited. Thanks for posting the nice pic of the lovely Miss Livvy. She is such a beauty! I’m glad you’re OK! How have you been since the removal? Any digestive changes? Just keep an eye on your symptoms. The healthy diet can’t hurt ya! Glad you feel better. Yeah, don’t mess around. If it flares again, you may need to get it out. My mom waited and hers was completely infected and nearly burst. I wish they could find out stuff like that BEFORE they send you in for surgery. Then you would feel more confident about the decision to remove it. That said….A year or so ago, I went in for a routine exam to get surgical clearance for my crooked toe to be fixed. (It was a painful hammer toe that needed to be corrected.) When my doctor asked about meds I’m on, I told her I was on omeprazole (Prilosec) for my reflux. She then sent me to gastro doc, who sent me for a bunch of tests and then sent me to a surgeon. The surgeon wanted to take my gallbladder out even though I never had ANY problems!! When I told him no, he was ANGRY and told me that I was the one who came to them for my stomach “issues!” Talk about frustrated!! I went in for a wonky toe and they wanted to take out my gallbladder!!! Beware and do your homework.